The Cumberland & Dumfriesshire Farmers Mart P.L.C. 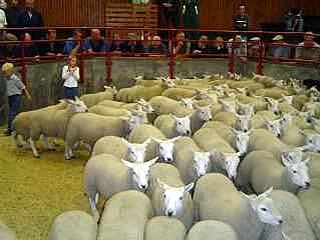 had forward 4,739 store lambs (including 1,678 Cheviots) at their sale on Tuesday 29th September 2009. Store lambs easily maintained late high rates with several distant buyers to the fore. Top price of £54 for Texels from Silloans, others £52.80 Clarghyll, £52.20 East Foreshield; Suffolk £52.20 Clarghyll, £52 Rosgill Hall, £51.80 Lea Hill; Cheviot Mule £47.20 Maxton; Greyface £47 Taylorburn, £46.80 Coatlith Hill, £45.20 Hardhurst; Blackface £44 Silloans, £39 Sundhope, £37 Low Eals; Swaledale £35, £32 Byers Hall, £30 Blakelaw. Suffolk cross Mule ewe lambs to £53.50 Borthwick Brae. Cast rams to £50 Candybank. There were 1,678 Cheviots which saw all classes in demand with prices a shade dearer on the week. Hill Cheviots to £43 High Thorneyburn, £42 Glendinning, £41.50 Chanlochfoot. Hill Northies to £48 Toftholm, £46 Powisholm, £45 Effgill. The Cumberland & Dumfriesshire Farmers Mart P.L.C. had forward 2,518 breeding ewes, shearlings, ewe lambs and rams at their Special Sale on Tuesday 29th September 2009. All classes met a very dear trade and were far short of buyers requirements. Top of £103 for Mule shearlings from Parcelstown, others to £99 Baron House, £94 Stockasteads, £93 Dykecroft; Cheviot Mule £98 Longrow; Texel £92 Longrow; Blackface £82 Candybank. Correct ewes to £91 for Texels from Longrow; Suffolk £95 Lymthe Holm; Cheviot Mule £86 Glendearg and Longrow; Greyface £80 Longrow and Stackbraes, £77 Bayles. Ewe lambs sold to £97, £96 for a superior pen of Texels from Kirkton; Greyface £80 Old Police House, £66 Ellershope and D’Mainholm, £63 Hardhurst, £60 The Side; Zwartbles £59 Park. Rams were a poor show with best quality meeting a great demand. Top of £470 and £390 for Texel shearlings from Dormansteads, others to £270 and £260 Uppercleuch, £250 Priorsford.